Haibane – beings with flightless charcoal grey wings and a halo that lived in a town enclosed by huge walls. Nobody knows where they come from or how their world came to be. The story of a group of Haibane living in the Old Home is told in this 13 episode animation series. Ladies and gentlemen, this is Charcoal Feather Federation: Haibane Renmei. Also that wall idea reminds me of The Maze Runner. Difference is that in Haibane Renmei, they actually attempted to climb it instead of running through it. Thoughts after finishing the show: Wow. I’m speechless. Haibane Renmei is a beautiful, symbolism show. Nice artwork, cute characters, sensible story, and most of all; eargasm, atmospheric soundtrack. I can listen to this series’ soundtrack over and over and not get tired of them. The emotional impact of the story is also…gah. So much. What I like most is that there’s always something to think about. What’s the message behind the show? What are the characters trying to imply to each other? What are Haibane? Why are the walls forbidden? What is the true meaning behind their cocoon dreams? The show didn’t reveal many answers, but there are theories surrounding the Haibane. Concerning Sin Bound Haibane (spoiler warning again), a theory is that they might be people who committed suicide. Taking your own life is considered a sin in many religions, and that sin follows you after death, even if you are a Haibane. Rakka’s cocoon dream is that she is falling, and a bird is trying to save her. This is just my thought, but I think she committed suicide by jumping off a high place. The black bird may have been someone important who was trying to stop her but couldn’t. Fragments of the bird is in the Haibane world to remind Rakka that she isn’t alone and isn’t guilty. Reki may have died by letting a train crash into her, explaining the true meaning of her name and that bit at the end where she almost repeated her death twice if not for Rakka. They didn’t die normally or unexpectedly, but willingly, thus became sin-bound. If unable to go on their Day of Flight, they become a Failed Haibane. One other explanation of sin-bound Haibane is that they still have regrets and heavy ties to their past lives despite being unable to remember them. This spins them in a cycle of doubt and self-destruction. My thought (again) is that a Haibane can become sin-bound by an emotional trauma. In Rakka’s case, it is the shock of losing Kuu. In Reki’s case, it’s being betrayed over and over again. The series hints that Toga (those masked guys that could go in and out of walls) is actually a Failed Haibane. The communicator (the old man that gave Rakka her job) explained that Failed Haibane lose their wings, halo, and become old and die, not being able to live with neither Haibane or human. (The communicator and toga do not mingle with either.) A possible explanation is that the communicator and the Togas are Failed Haibane who work to protect other Haibane from the same fate. 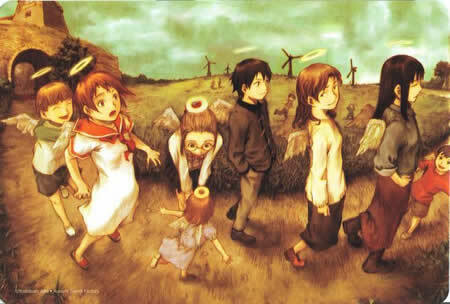 Haibane Renmei is one-of-a-kind anime. The aesthetics of this show is amazing for such an old anime. I would recommend it to anyone who has enough patience to take in what this show has to offer. The anime went under the radar for most people, but it’s worth your while. Before you go, I’d like you to hear my favourite soundtrack from the series.